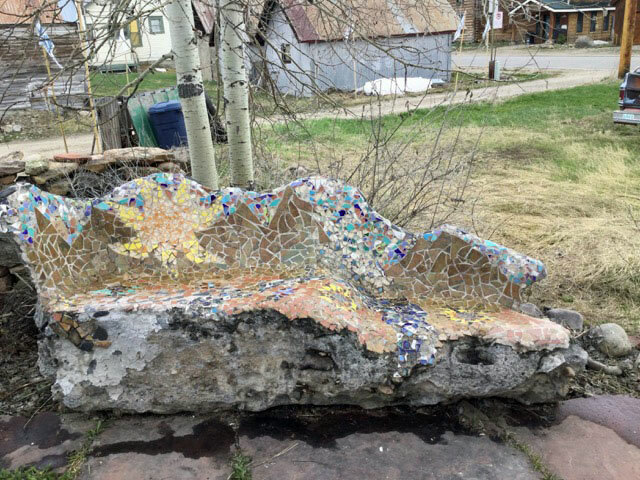 A few years ago, Karen J created a mosaic bench in her backyard using mining debris (large stones), cement, and chicken wire to form the base, which is similar the methods we recommend in our instructions for creating bases for outdoor mosaic sculptures. Karen modeled her bench after those made by the great mosaic architect Gaudi in Park Guell in sunny Barcelona, and she used brightly colored ceramic tile just as Gaudi had used. 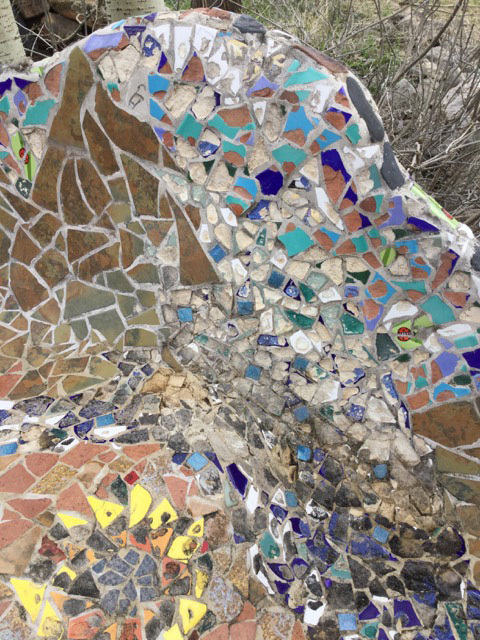 The problem is that Karen’s backyard is in Colorado, and so her mosaic experienced many long and hard freezes that a mosaic in Barcelona would never see. 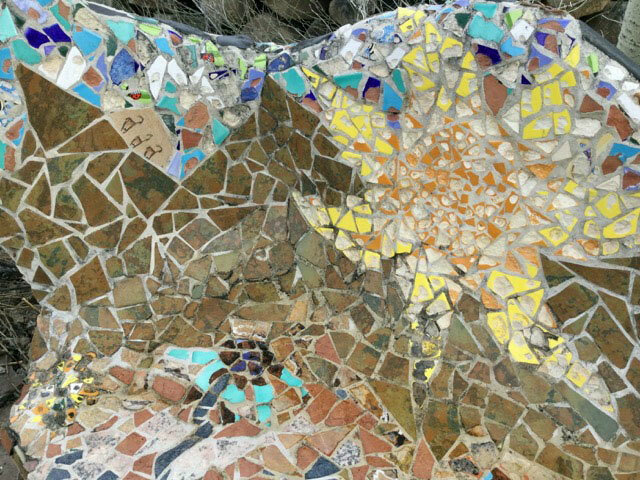 Mosaic Bench after Antoni Gaudi shows the ravages of freeze damage. Colorado winters are quite severe, but any temperature below freezing can crack and flake ceramic tile. Glass mosaic tile is non-porous, and so water cannot seep in and freeze and crack it, and so glass is preferred for outdoor use, as is porcelain tile for the same reason. On the other hand, ceramic tile tile is very porous and soft, and so water can penetrate it (through tiny cracks in the glazing). Once this water freezes and expands, it cracks the ceramic tile and often causes the face of the tile to flake off. Mosaic Bench Detail showing freeze damage. Note that the empty sockets in the blue tile are NOT where tile has popped off. Instead, it is where the faces of the tiles have flaked off due to water freezing and expanding in tiny cracks and pores. In the photo above, you can see how some colors were more resistant to freeze damage than others. This difference was not due to the color but to the variety of the tile: some brands of ceramic are harder and less porous than others. Also, some brands have thicker glazes, and that can also affect how permeable the tile is to water. You can minimize freeze damage by sealing your finished mosaic with multiple applications of a tile and grout sealer from your local building material store. Avoid ordering sealers online during winter months because water-based silicone sealers ruin if they freeze during shipment. 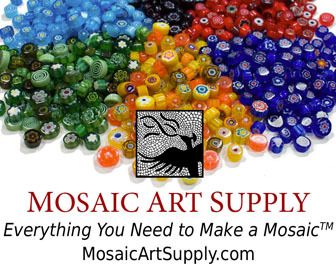 You should also clean and reseal the mosaic each fall. Small mosaics such as mosaic stepping stones can be brought inside for the winter. Mosaic Bench Second Detail showing freeze damage. Imagine how bright the orange and yellow sun was before Freeze Meister blasted it and flaked off the color! This entry was posted in Inspiration, Joe's Rantings and tagged ceramic tile, outdoor mosaic, restoration, sculptural mosaic, troubleshooting, waterproofing on June 6, 2016 by Joe Moorman. Hi! Thank you so much for this information. I used pieces of Talavera in a patio mosaic, and it was ruined over the winter, exactly as you described in your article. I’m starting over, and wanted to ask you about sealing the pieces before setting them. Is this preferable? Can you recommend a product to seal and protect the pieces of tile? I hate to hear that, but Talavera is the softest, most vulnerable type of tile there is. (That is why we don’t sell it.) Pre-sealing won’t do anything positive that sealing after grouting wouldn’t do, but you would risk getting the sealer some place that grout will need to stick. My recommendation is to make sure you apply the sealer 3 or 4 times after the grout is cured. It’s quick and easy. Just wipe on and wipe off. That is the best way to make sure all the tiny pores and cracks are sealed. Would you recommend a product? It’s driving me nuts scouring the hardware stores trying to figure out what might work. Thanks so much! Hi, I created a very large mosaic floor a few months back, I bought sealant to give it frost protection but due to the terrible summer we have had there hasn’t been a single period of time that the area I’ve tiled hasn’t been wet from the rain and we are now at the point where frosts are going to hit. I don’t want to apply the sealant whilst the grout/ tiles still have moisture in them as I’m guessing that will become trapped as they’re laid on a water proof cement Base with waterproof adhesive etc. Do you think using polythene or horticultural fleece would be adequate enough to get it through the winter or am I fighting a losing battle? I’m not sure which type of ceramic tiles they were. They were a mixture of ceramic, porcelain and glass which I got in the diy shop clearance section. If you’ve any advice I’d really appreciate it. It sounds like you live somewhere with very hard freezes, and it sounds like this floor mosaic is outdoors. Your situation is further complicated by the fact that there is a range of material that could include some very soft ceramics that would be vulnerable to freeze damage. I think the floor would need to be dry for the sealer to cure, and so you are right to not attempt sealing until conditions are right. That being said, you might be able to use borrowed fans and heaters and extension cords to create the conditions you need. Horticulture cloth is permeable, and so that wouldn’t work. Even construction plastic won’t be effective if water can leak under from the sides. Rather than trying to keep plastic on it all winter and preventing water from leaking in from the sides, I would probably go the heater and fan route.